In their quest to become an Insight Driven Organization (IDO)—those that turn analytics into a core capability by promoting a culture of data-driven decision-making—Canadian businesses have made significant technology and data investments. Yet until organizations are ready to engage the power of their people, IDO success will remain elusive. This post on talent and capability development is the third of a four-part series on the four ‘people’ levers organizations can pull to gain an analytics advantage: leadership; operating model; talent and capability development; and culture and change management. Tune in next week for part 4. Analytics skills are in short supply and that’s doubly true for analysts with more than quantitative skills. Too often, organizations believe that building an IDO comes down to hiring a squadron of Ph.Ds. Yet this is proving to be not enough. The reality is that truly high-performing teams include a mix of people with red skills (i.e., software developers, data architects, data scientists, information designers) and blue skills (i.e., change managers, political navigators, subject matter experts, design thinkers)—a combination that fosters the development of “purple teams”. This idea is catching on more quickly south of the border than in Canada. In the U.S., 34% of organizations view analytics skills and an analytics mindset as essential from the boardroom to the front office. In these organizations, processes exist to hire for or develop purple teams with a mix of functional and technical skills. In Canada, only 20% of organizations have followed suit. And in the UK, a recent Deloitte survey found that while 70% of respondents hope to hire analytics talent in the next few months, less than 10% have specific metrics to measure performance, succession plans to replace existing talent, or any training or learning and development programs for analytics. 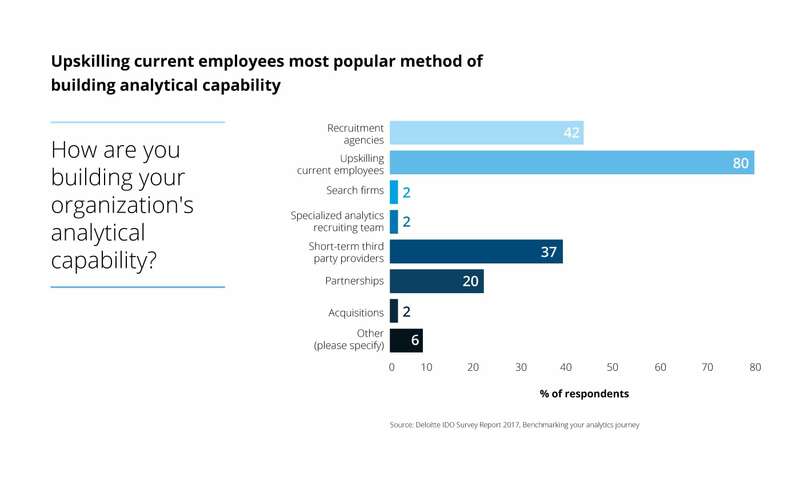 As the talent gap widens, organizations committed to reaping the benefits of insight-driven decision-making will need to take a two-pronged approach to talent and capability development: co-creating internally with the business to build purple teams and externally with partners to augment their capabilities and fast-track returns. Understand your people’s values, expectations, and engagement needs. This allows you to not only identify your talent requirements and gaps, but to also create career paths designed to attract the mix of red and blue talent you most need. Hire people with purple potential—those who both understand the analytics process and have business instincts. At Deloitte, we look for data scientists with more than quantitative skills. The best analysts also have methodological skills (an understanding of the analytics process), advisory instincts (the ability to think through a business problem), and leadership skills (the ability to gain buy-in for the analytics journey). Share expertise by seconding analytic resources to different geographic locations, rotating people to different business units, building cross-functional teams, and encouraging red people to work with blue mentors. At Deloitte, in addition to receiving formal training and mentoring opportunities, our red people work in cross-functional teams so they can observe blue people in action. This is bolstered by a clearly articulated analytics culture. Given the finite pool of available analytics talent, most organizations must bolster their internal teams with external partners. Although smaller projects can be crowdsourced or solved through open competitions or hackathons, it makes better sense to co-create larger, longer-term initiatives with an analytics partner. Notably, this isn’t about transactional outsourcing. It’s about developing strategic partnerships with providers who can deliver missing capabilities on demand, who possess blue skills such as business acumen and storytelling capabilities, and with whom you can co-develop IP, share expertise, and foster the transfer of knowledge. Organizations are taking steps in this direction. Rather than focusing talent attraction on channels that traditionally attract people with red skills (such as graduates in statistics and computer science), they are working to bolster their teams with the addition of blue people. 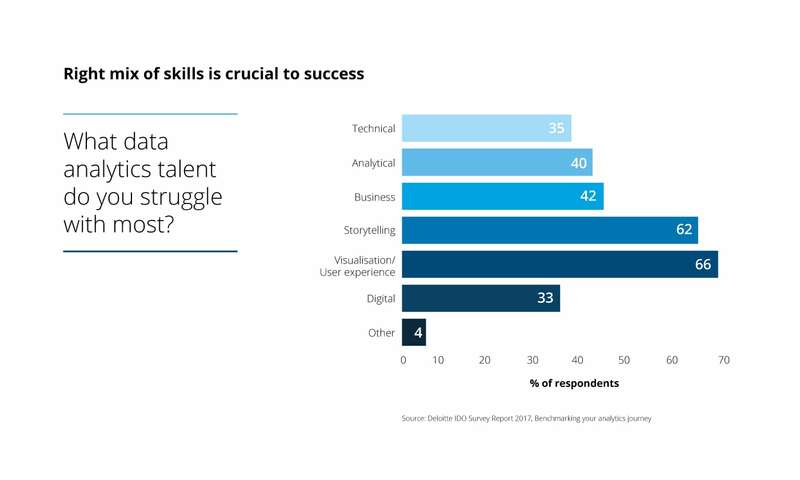 Admittedly, they have their work cut out for them, with a majority of organizations saying they struggle most to attract people with business, storytelling and visualization skills2. Despite the challenges, the payoff for building purple teams is considerable. Although you may not get things right from the start, the willingness to bolster nimble internal teams with external partners can help you not only close talent gaps but build the momentum you need to fast-track the return on your analytics investments.